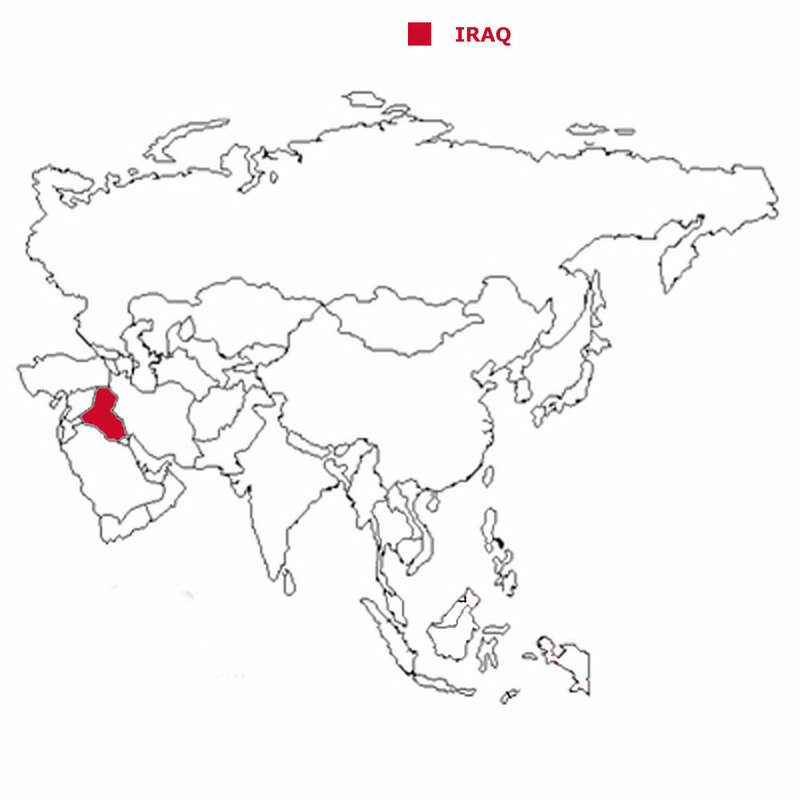 Iraq is a large in the south west of Asia. Iraq has a small border on the Persian Gulf. The land is a mixture of flat plains and flooded areas togther with mountains in the north and east. Check the weather in Baghdad now. The capital of Iraq is Baghdad. Iraq is a federal parliamentary republic with a president as head of state and a prime minister as head of the government. The currency in Iraq is the Iraqi dinar. These are the words to the Iraqi National Anthem called My Homeland. It was adopted as the National Anthem in 2004 by the American adminstrator after the defeat of Saddam Hussein. This is a translation of the words. We have already written our own history of England but are asking schools in Iraq to provide us with a detailed history of their own country. Check how here. 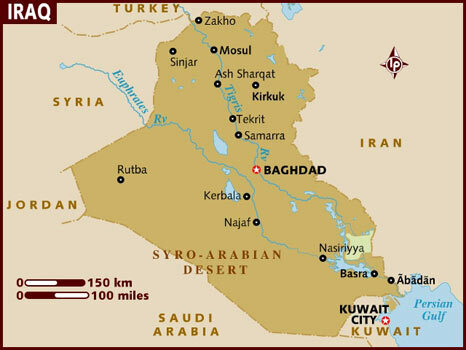 The total land area of Iraq is 437,367 sq kms which is the 16th largest in Asia. Iraq has lakes, rivers and canals which total 950 sq kms. Iraq has a coastline of 58 kms which is the 36th longest in Asia. The highest point in Iraq is Cheekah Dar at 3,611 metres. 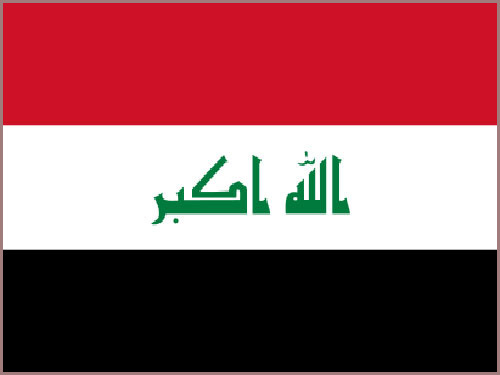 The total population of Iraq is 38.15 million people, making it the 15th largest country in Asia by population. 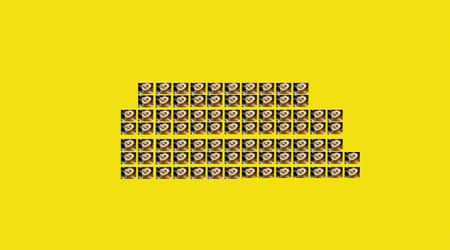 Of this number 18.89 million are females and 19.26 million are males. A person from Iraq is called a Iraqi. To be a citizen of Iraq, one of your parents must be a citizen of Iraq. It is not sufficient to be born in Iraq. You have to live in Iraq for 10 years before you can begin to apply for citizenship. 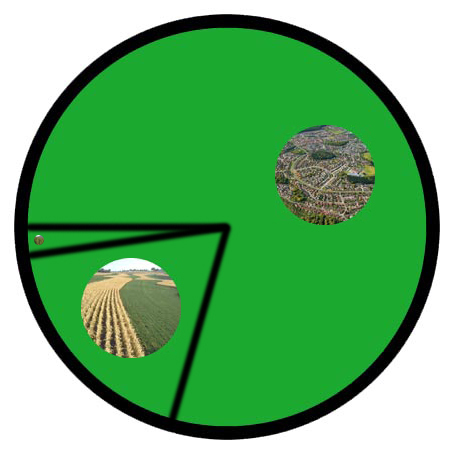 69.5% of the people live in cities or towns. The death rate in Iraq is 3.8 deaths per 1,000 people. There are 34.2 deaths of girls under 1 year per 1,000 of births and 40.6 deaths of boys. 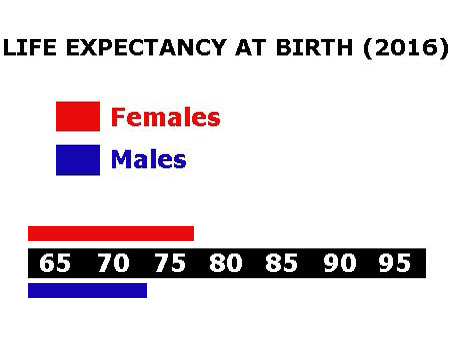 The median age for females is 20.3 and for males is 19.8. The median age is that age which divides the population exactly in half so there are the same number of people above the median age as below it. The elderly dependency ratio is 5.5. 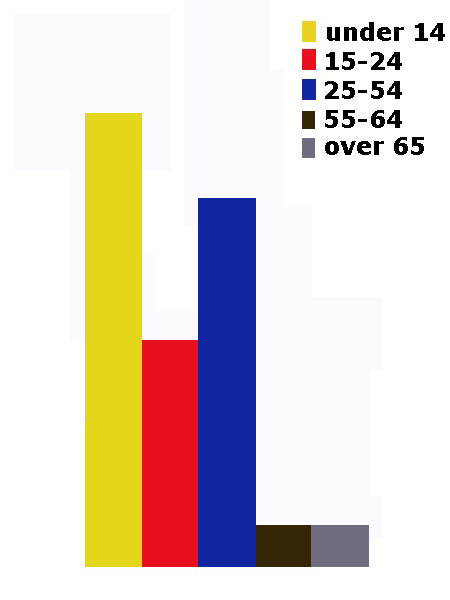 This is the number of elderly people (ages 65+) per 100 people of working age (ages 15-64). The potential support ratio is 18.3. This is the number of working-age people (ages 15-64) per one elderly person (ages 65+). As a population ages, the potential support ratio tends to fall, meaning there are fewer potential workers to support the elderly. Iraq spends 5.5% of its total income on health care. There are 0.61 doctors per 1,000 people. 30.4% of the population are estimated as obese. 93.8% of the urban population and 70.1% of the rural population have drinking water that is either piped into their home or they have access to a public tap, a protected borehole, well, spring or protected rainwater collection facility. 86.4% of the urban population and 83.8% of the rural population have access to a flushing toilet that is connected to a sewer. a pit latrine (that is a permanent hole in the ground that is looked after) or a composting toilet. 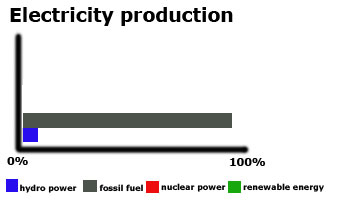 Iraq releases 137.0 million metric tons of carbon dioxide by burning fossil fuels in the process of producing and consuming energy. This puts it as the 17th highest in Asia. We have no figures for the amount Iraq spends of its total income on education. Children usually start school at age 6 in Iraq. Primary education is for six years until age 12 and the amount of compulsory education. Secondary education can continue till age 18. This may be followed by further education at a university or college. We are awaiting information on school terms in Iraq. 73.7% of females and 83.7% of males are able to read and write by the age of 15. The total number of people available for work in Iraq is 8.90 million. 16.0% of the workforce are unemployed. There are 72 paved airports in Iraq, which is the 11th highest number in Asia. There are 2,272 kilometres of railways in Iraq, the 20th longest in Asia. There are 59,623 kilometres of roads in Iraq, which means Iraq is in 17th place for the most kilometres of roads in Asia. There are 4 major national newspapers in Iraq. There are 30.2 million mobile phone users. 8.10 million people have access to the internet at home via any device (computer or mobile).